In this coin magic trick we used American dollars. British 50 pence coins also work well. Or any coin with a diameter of 25 mm or there about. A ‘close up’ mat is a high density sponge about 5 mm thick covered with a nonslip surface and helps with the handling of the coins. It also absorbs sound and shocks so you won’t have coins jumping off the table. Close up mats are easy to find on the internet. Ask a parent to help you find it online. You can also use a folded blanket or similar soft surface to start with. 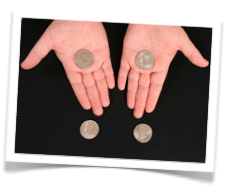 Your starting position: palms facing upwards, place one coin in the palm of each hand, leave the other two coins on the mat. 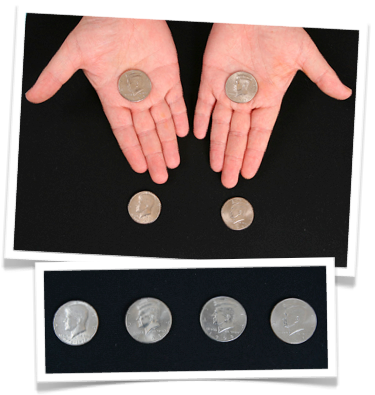 Close your hands over coins in your hands as shown in the picture. 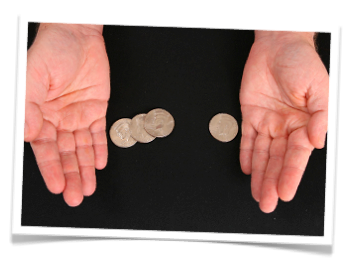 For this step, you ask someone in your audience to place the two coins on the mat on top of your fingers like in the picture. This step is your first ‘sneaky move’. In this step you are going to turn both your hands over so that the backs of your hands are facing upwards. While doing this you are going to ‘try’ to catch the coins, but appear to fail as you drop the coins on the mat. This takes a bit of practice to get right. Follow the pictures below to learn the move. 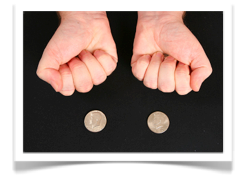 Your audience will be thinking that you have dropped both the coins that were placed on your fingers and you are going to try to catch them again. But in actual fact, you have two coins in your right hand and non in the left. 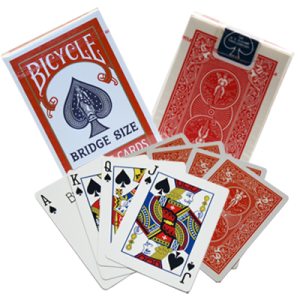 Now repeat Step 3 asking someone to place the two coins on your closed fingers again. 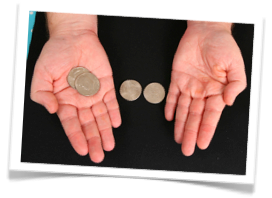 Turn your hands over again so that the backs are facing upwards, this time successfully catching the coins. Slowly open your left hand revealing one coin has disappeared. Open the right hand and show it has jumped across as if by magic! You have made a coin magically jump from one hand to the other! 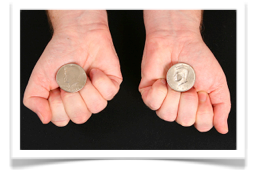 Enjoy this really cool coin magic trick.